PPP is the Proposal Preparation Process from PROJECT in a box developed to help organisations respond to competitive tendering opportunities. Managing individual sales opportunities has much in common with managing projects except that the timescales are tighter, the risk is greater and there is usually a lack of information. It is therefore incredible to think that organisations don’t insist on a formal structured method for their sales/proposal process. 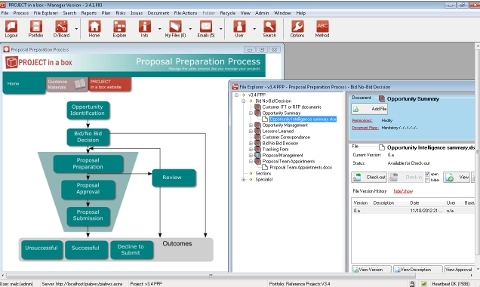 PPP provides users with a set of processes, templates and checklists to help the proposal manager work through deciding whether it is worth bidding for a piece of work and then controlling the process through to the outcome be that success or failure and then hopefully transitioning on into delivery and handing over to the project team. PPP is provided as standard in all editions of PROJECT in a box. Your project is unlikely to be a success if your proposal was a failure. Furthermore many project managers struggle when they lack key information from the tender or proposal phase. Sad but true. Bidding is quite a ‘personal’ process and every organisation develops its style and culture. Of course with PIAB you can personalise your PPP to match the way your teams work. Of course if you are managing many opportunities at the same time you will have additional pressures. You will want to have an idea of what the timing and confidence in these means for your business. Multi-user editions of PROJECT in a box enable you to group your bids based on their properties. You can also then report on their progress using current data from the opportunities you select. Your produced reports will be both graphical and data driven. You can personalise the content and structure of your reports if you want.